Sorry for the lag in between posts but December has been a very busy month for me! Dave got a great job offer in London, Ontario, and we have both quit our jobs in Toronto and sold out house already. Rosie has gotten into our #1 pick for daycare (after much time and persistence on our part), and now we are house hunting in London. A goal in moving to London is to be closer to my family (my mom especially who's crazy about Rosie and vice-versa), to get away from the bustle of Toronto which we're kind of sick of, and to provide a more relaxed environment for Rosie to grow up in. Another goal was for me to be able to devote more time to my artwork and comics in particular! It's been very hard with a 50-hour/week job, plus a toddler and a husband (who I like to see) to get much time to work on my artwork, but hopefully you will notice an increase of updates here of more art-related postings. Other than that, we'll see where the wind takes me. Here is some artwork of a recent commission I did for the "Way Off Broadway"singers. This is a singing duo from London who do local gigs and wanted an illustration to use on their CDs, business cards and marketing material. They wanted caricatures of their likenesses along with an image that showed that they're fun guys who don't take themselves too seriously. 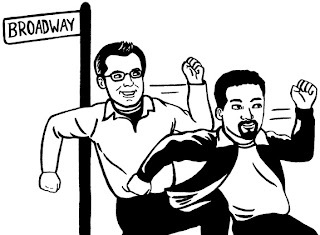 Initially I did a drawing of both charaters running away from a Broadway sign (from their name - Way Off Broadway), and I tried to put equal emphasis on both. The client Abe, correctly pointed out that really both should be running in the same direction away from the sign. This meant that one character would be in the foreground though, and the other in the back. To try to keep an equal weighting on both I made Jeff substantially taller (which from the photos it looks like he is in real life), plus with cartoons you always have the license to exagerate features somewhat. Below is the final piece which I was quite happy with and the client too! Lastly, Shawn Hoke recently gave my Rosie Stories mini a new review at his site. Hey Deeee-ana! Blog more. How's London, how's life out west? how are the comic shops out there? Are any shops willing to carry your comics? What'sahappening? C'mon, it's March - are you going to come back for any shows when the weather warms up...? I've gotta update my site with new shows for the year. So far I have MOCCA lined up in NY in June, and I just registered for Word on the Street in the Fall, so look for me then for sure if not sooner!